Video communication offers significant benefits for improving group collaboration and breaking distance barriers. 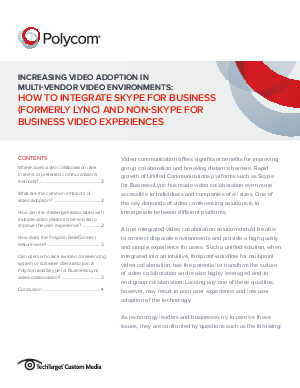 Rapid growth of Unified Communications platforms such as Skype for Business/Lync has made video collaboration even more accessible to individuals and companies of all sizes. One of the key demands of video conferencing solutions is to interoperate between different platforms. Download the report to learn how to increase video adoption within your organization.